Mandie and other intriguing characters explore a new mystery in each new publication. The dialogue is colorful, and the situations are almost true to life for the time period. It's 1906, and Mandie and Celia are off to college. 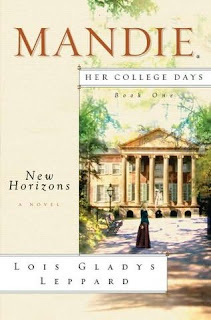 Newly arrived at the exclusive Charleston Ladies' College, the girls are faced with a campus full of unfamiliar faces and fresh challenges. Despite Mandie's best efforts to make new friends, however, most of her classmates will have nothing to do with her. It's a mystery Mandie can't fathom. To make matters worse, April Snow--Mandie's rival from the Misses Heathwood's School for Girls--has also enrolled in the college. Could she be infuencing the others to give Mandie and Celia the cold shoulder?